Our Los Angeles dentist can help patients look and feel their best with a wide range of preventive, restorative, and cosmetic procedures. Unique treatment plans, created for all patients who visit our office, support successful outcomes that patients will love. Our warm atmosphere and compassionate staff also creates a positive dental experience. Here is more about the services we provide. Prevention of oral health problems is promoted through routine cleanings and other treatments. At regular check-ups, our Los Angeles cosmetic dentist cleans the teeth thoroughly and removes accumulated plaque and tartar using special instruments. Fluoride treatments, which help strengthen teeth and guard against decay, may be recommended based on individual risk factors and dental history. X-ray imaging is also used to identify problems early for improved prognosis and easier treatment. Restorations include several procedures used to repair teeth after they have been damaged by decay or trauma. 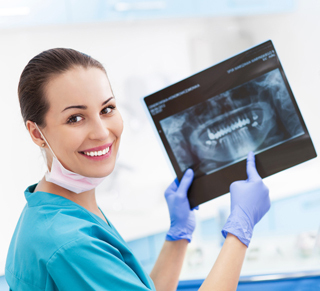 Depending on severity, our dentist may repair cavities using bonding, fillings, inlays, onlays, or crowns. If teeth are infected, our dentist in Los Angeles may recommend root canal treatment or endodontic surgery. We can replace missing teeth with dentures, bridges, or dental implants. While early gingivitis may be treated with antimicrobial rinses or scaling and root planing, severe periodontitis can be addressed with procedures that include tissue grafting and gum flap surgery. Our selection of cosmetic dental procedures can improve many different aspects of oral appearance. For tooth discoloration, our dentist may recommend teeth whitening, bonding, veneers, or crowns depending on the cause and severity of the issue. When teeth are cracked, chipped, unevenly spaced, or improperly formed, our dentist can conceal those issues permanently with treatments such as bonding, veneers, and crowns. Invisalign is available for correcting most types of bite irregularities, including overbite, underbite, crossbite, and uneven spacing. Daily brushing and flossing is important for oral wellness, but regular dental check-ups form an essential foundation for keeping the teeth and gums healthy. Regular check-ups and cleanings not only increase protection from oral health problems but also keep the teeth and gums looking good. To learn more about our services, patients can schedule a consultation with our cosmetic dentist in Los Angeles.